Paul was born in Omagh, County Tyrone and now lives in Letterkenny, County Donegal. 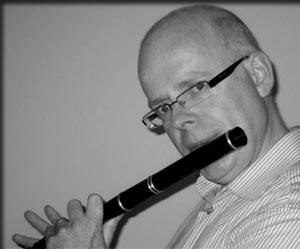 He began playing the flute when he was 14 and won the senior All-Ireland flute competition in '93, '94 and '95. His mother was from County Sligo and Paul remembers many house sessions in her homeplace near Tubbercurry where local musicians would gather including his uncle Gerard McCarrick and other relatives. • "Unearthed", featuring Paul McGlinchey, Brid Harper, MacDara Ó Raghallaigh, Stevie Dunne, Ryan Molloy and Seamus O’Kane. Check out the Paul McGlinchey website to find out more about Paul's two albums, listen to samples and purchasing information.